Amazon has worked out how to cut delivery times as a way of encouraging more orders and satisfying more customers more promptly through expanding its US warehouse network and making some overnight and even same-day deliveries. And it’s even looking into the feasibility of using drones to deliver items within one-hour of receiving the customer’s order. It beats spending hours trudging around stores in the hope that the product you want is in stock or is in the colour you prefer only to return home empty handed if it isn’t in stock or has been discontinued. Amazon hasn’t announced how much delivery time it expects to save with “anticipatory shipping” or if it’s already put this into practice. 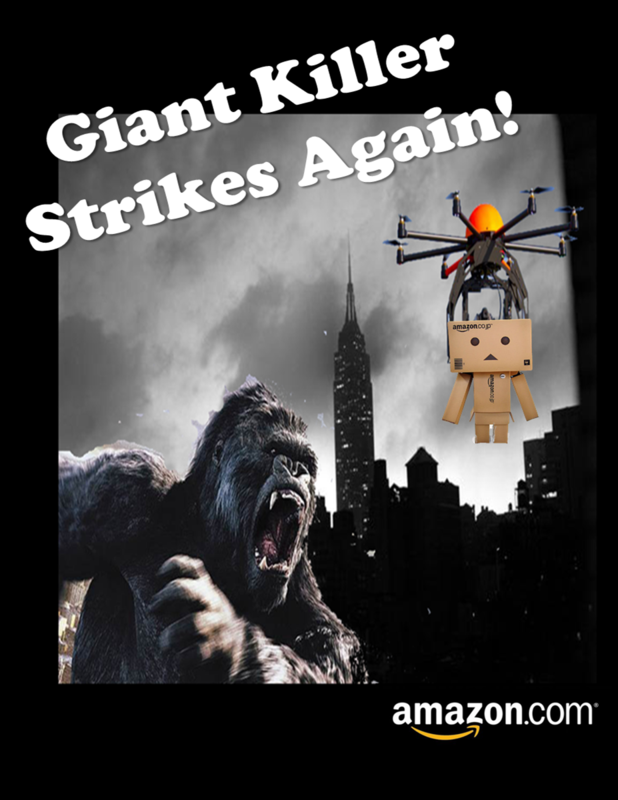 But is this really a glimpse into the future or a clever PR stunt by Amazon to capture more headlines for its service? The idea is certainly not a new one, that’s for sure. About 30 years’ ago McDonalds started studying patterns of how much of each menu item was ordered and segmented this data by location and time of day, so that when a customer walked into their local outlet, the Big Mac they were about to order was already cooking on the griddle. Other fast food vendors have since followed suit, as have big box retailers. So is the Amazon patent really an application of “just in time” inventory practices? 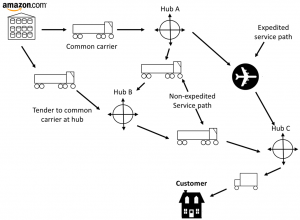 After all, Amazon already can offer next-day delivery given that it has a bank of predictive algorithms on its computer systems and loads of local warehouses across the US, so does it need to predict the exact minute a customer orders something, a day or two in advance, and have the package arrive within the hour of order? 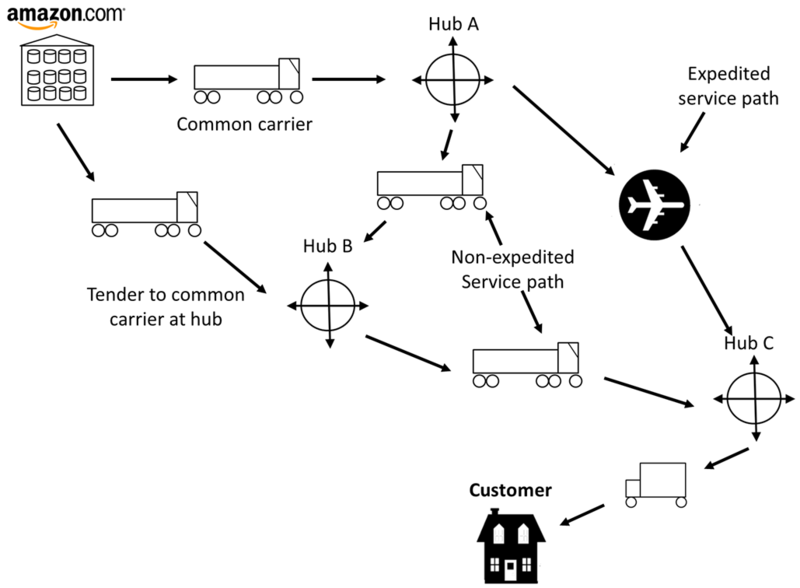 According to the patent application, the packages Amazon predicts customers want to buy will wait for the signal at the shippers’ hubs or on trucks until that anticipated order arrives (see diagram). So it’s not about shipping unordered items to the customer as the WSJ news headline appears to suggest. Instead, it’s about shipping items, packed for delivery to an undesignated customer, to a shipping hub near the customer. If the customer orders it as predicted, a box gets a full delivery address on the label and goes on the truck; if not, it’s held, sent back, or sold to someone else. The final hubs aren’t full scale fulfillment centres with big inventory, order picking, and packing; they’re just box handling operations. If the system detects a partial truckload going somewhere and empty space at a destination hub, that’s a good time to preposition some items likely to get ordered soon. So this is less about science or complex logistics management and much more about driving incremental sales. It also means that on its website, when a customer logs in for a shopping session, Amazon knows what items are pre-packed at the fulfilment centre that this customer may have ordered in the past, such as boiled peanuts, and suggests a re-order of this item accompanied by the selling message ‘IMMEDIATE DELIVERY’. Of course there’s a premium $5 delivery charge on the can of boiled peanuts but a customer’s hunger may outweigh the economics of popping down to the local supermarket and avoid paying a $5 delivery charge. Then again, this customer probably buys these items from Amazon on a regular basis because they can’t find them locally or at the same price. Should Amazon take the risk of delivering items to a consumer that hasn’t actually ordered them, then it’s said it will happily convert the “order” to “gift” status in order to avoid costly returns. In reality, the WSJ news item looks like a clever bit of PR for Amazon as there’s lots of social comment about how it can fulfill orders faster than a butcher boy on a bicycle and how this will drive incremental sales in the future. And we’re not talking peanuts!